← How many legs does a momma hen have? Ready for the next challenge, we have taken on honey bees at our urban farmlet! Two classes from Seattle Tilth and one book later, I found myself building hives (just) in time for the arrival of our bees. The bees I’ll write about later. This post is to detail building top bar bee hives. TBHs retail for ~$300. I was pretty sure I could make one for less. I looked at a lot of pictures and designs for hives online. I visited a neighbour to see how he built his hive. I decided I wanted an observation window, a side entrance, top bars with guides, and a screen floor. I loosely followed the plans in Les Crowder’s book, but modified them for desired features and, well, because I’m not that great a carpenter and had mistakes to fix! Carpentry skills or no, I indulged in two new tools for this project. Why did I wait?! I love love love my new saw and router. Both Makita, the circular saw cuts like a dream (compared to the 20 lb vintage steel Craftsman of my uncle’s father that I had been fortunate to borrow for many years). The router – well, it’s my first (blush). I knew there was something important missing from my toolbox. This was it. We bought three 8′ 1″ x 10″ pine boards for the hives. Side boards were cut to 44″ long. I aimed for 120-deg bottom angles for the walls, so cut the end boards 18 1/2″ on the top edge and 7 3/4″ on the bottom edge. The follower boards are the same size as the end boards. [A follower board constricts the hive – you move it further back in the hive as your population expands]. For the bottom, I tried to bevel the edges for a tight fit with the side boards. They’ll do, but I did make some math errors 😐 The screen floor didn’t come together in time, so the hives currently have solid floors. Figuring out how to make observation windows was one of the most challenging aspects of this project. I ultimately re-used some pieces of acrylic and polycarbonate. Each sheet was not long enough for an entire window, so I ripped them in two (with a blade for plastic on my new saw) and made two windows per hive. After cutting and routing spaces for the windows to sit flush on the inside of the hive, I glued the windows in place. On the first hive, I cut a 6″ wide opening for the bee door in the side panel – just below the window. I quickly realized that was not going to work – you can’t be bee-gazing right in the flight path of said bees. So I plugged that opening and routed another on the plain sidewall – opposite the observation windows. I attached a 7″ length of quarter round just below the bee entrance as a landing pad. I forgot to take a photo of that, so you can see it on the next bee post. All the hive body joints were glued and screwed for strength. Cracks were filled with sawdust mixed with glue (I am proud I thought of that myself). I used my rock strap tie-downs from my motorcycle to hold the sides and ends together as the glue dried. The top bars are pine stakes (1 x 1 3/8″) purchased in packages of 12. I cut off the stake part for a length of 19″ – flush with the top sides. On the underside of each bar, I glued and nailed a 16″ piece of quarter-round molding – it is rounded on one side, but vertical on the other, with the vertical part along the midline of the bar. That will (hopefully) guide the bees to build their combs straight and parallel. And that’s pretty much it. I cut some shutters to cover the observation windows, attached them with hinges and wing clasps. I painted the outside of the hive body and the legs, and threw the plywood cover on top. Then it started to rain and we left for Moab. I also used wood glue, scrap 2×2 for the legs, metal brads, and paint already on hand. Cost per hive was therefore about $80. Not bad. This entry was posted in bees, DIY, top bar hive and tagged contruction project, honey bees, urban farm. Bookmark the permalink. Your carpentry looks fine from here. Many of the best carpenters make mistakes. They just know how to hide them. 8) If skill were a real concern then we would have urged Tanzanian rather than Kenyan hive design but having already made one hive your next ought to be the same or compatible. What glue did you use for the observation windows? Our plexiglass window was attached by screws at the corners and bowed in hot weather causing gaps. We have since switched to glass. I ended up just using wood glue. One window is acrylic and the other polycarbonate. Hmm – will look out for bowing! How did you attach your glass? My second hive was definitely an improvement. 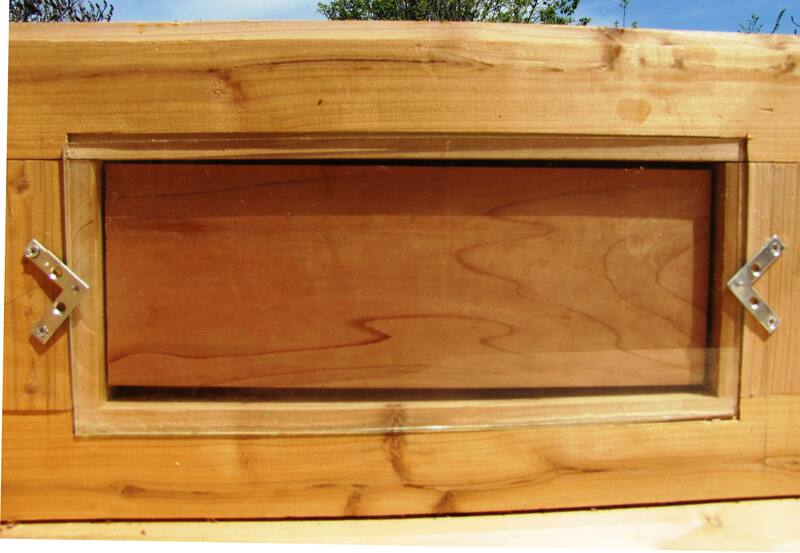 I guess another advantage of the Tanzanian hive is you could use Langstroth frames in it. Well, I am hopeful the angled sides will prevent too much comb attachment! thanks for your note! And, yes, Langstroth compatibility was one reason for our choice of Tanzanian. Another was simplicity. For every beek claiming that sloping sides would prevent attachment and straight sides guarantee it was another insisting that the bees would attach or not as they saw fit regardless of slope. In our brief experience they did attach significantly but we suspect it was due to very hot weather and very heavy comb. A Kenyan of given top bar length has comb of less area (and so less weight) than a Tanzanian of the same width and depth. We expect to be cutting the attachments this year. We shall see if they reattach.